We were fortunate to have a good deal of equity in our house and paid cash for everything shown here. Many of these expenses are not necessary to the full-timing life and we may have spent more than others in some cases and less than others in some cases. One of the keys for us was purchasing these items while we still had a very good income before our resignations took effect. Even though some of these expenses may seem extravagant or unnecessary, hopefully this page will at least be helpful in identifying expenses you may not have thought of or give you a ballpark idea of costs you can expect. 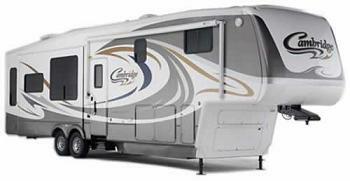 Note: The Keystone Cambridge was discontinued after its first and only model year due to lack of demand. It's a great rig - too bad. Note: Direcway became Hughes.Net. 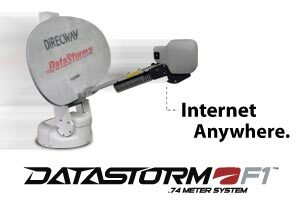 In January 2006, we upgraded equipment and moved the dish on our roof at the recommendation of Mobil Satellite Technologies (Mobilsat). We then bought the Hughes.Net satellite internet service through Mobilsat rather than Motosat. Than annual cost has been $798 since that time. Note: We still have the same DirecTV features as when we started, but the prices have increased quite a bit. As of 2010, we are paying about $85 per month. Due to our situation, we decided to pay all insurance costs up front for one year. That is why we included insurance for the first year in this section. It may be wiser to pay for insurance on a monthly, quarterly, or semi-annual plan, but we liked the peace of mind of making sure these large expenses were paid in full for at least the first year. Note: Though we still have Anthem Blue Cross/Blue Shield, we've changed plans twice. As of 2010, we have what is called a Lumenos plan with a Health Savings Account feature. It is a 100/0 Plan with a $10,000 deductible and a $155 monthly premium. In 2007, we changed to a monthly payment rather than annual. Note: We are still paying Life Insurance, RV Insurance, Truck Insurance, and Umbrella Insurance annually. Note: Loving photography and wanting to document and share our experiences on this website, we decided to buy some topnotch camera equipment while we were still working and could afford it. 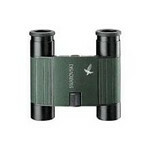 Note: Being birders, we wanted to get a top pair of compact binoculars for hiking - agian, while we could still afford it. This pair was a great addition to the Eagle Optics Ranger model ($400) that we already had. Note: We replaced the swivel rocker recliners that came with our rig with La-Z-Boy Pinnacle Rocker Recliners (leather fabric - Cobblestone). We found that the recliners that came with the rig were not good quality, and because they were swivel rocker recliners, there were heavy and hard to move when preparing to stow them for travel. 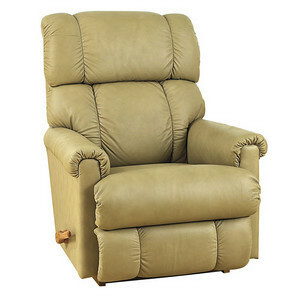 The La-Z-Boy recliners are narrow, lighter, and the backs come off which made them easy to get in the door. In our travels and talks with many full-timers, it has become pretty clear that buying your own living area furniture is a good idea. Later, we took out the sleeper sofa that came with the rig and replaced it with another identical La-Z-Boy recliner.